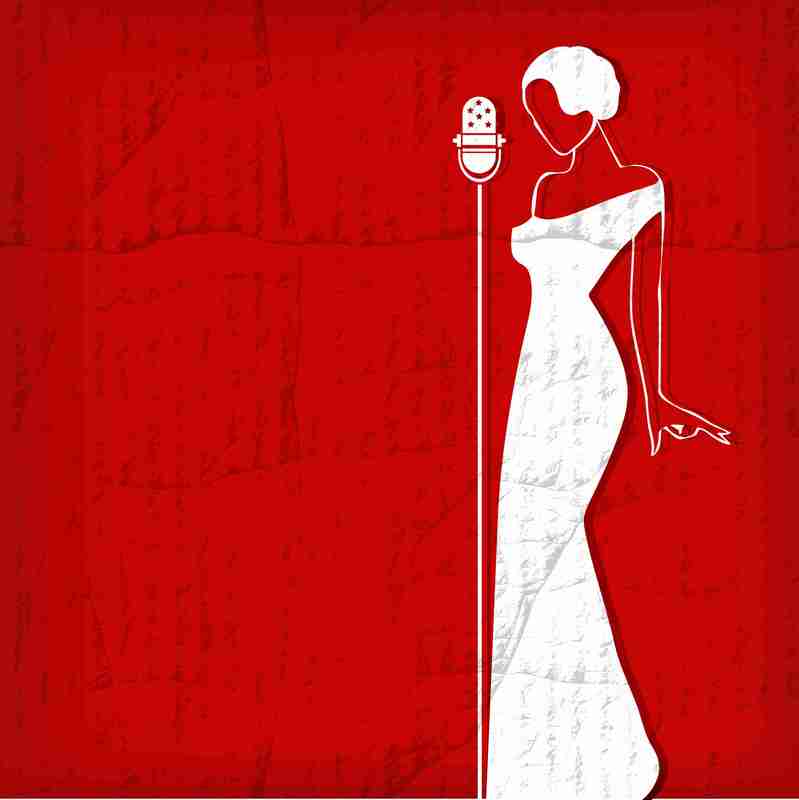 Proceeds from For Good: The Songs that Changed Me For the Better support Portland Musical Theater Company. 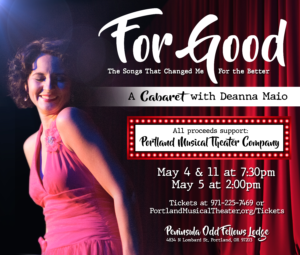 At the historic Peninsula Odd Fellows Lodge, Portland Musical Theater Company founder, Deanna Maio, will perform the songs from her journey as a musician, actress, and performer including classic show tunes, adult contemporary and pop favorites, swinging jazz standards, inspirational ballads, and more. We’ll start with her suburban Indiana roots with songs she’d sing into a hairbrush and dancing around with in her bed room, through her her first professional theater job, the recording of her EP “Deanna & the Downbeats”, to the creation of her first musical revue, and the birth of Portland Musical Theater Company. With Deanna’s signature storytelling approach, each song is like a mini-play that will have you laughing, and feeling inspired and joyful. In our supperclub-like environment you’ll enjoy the music at your candle-lit bistro table. Beer, wine, plated desserts, snacks and more are available for a suggested donation. This is the perfect respite from a busy week and great for a date night or an evening out with friends. Joining her are “The Downbeats” her jazz duo featuring K.J. McElrath on keys and Steve Morgan on bass. And don’t be surprised if you see Deanna break out her ukulele or kazoo at some point. Important Accessibility Note: the theater space at the Peninsula Odd Fellows Lodge is on the second floor. There is a staircase and a stair lift chair for our guests who prefer not to climb the stairs. We recommend you arrive 30 minutes before showtime if you plan to use the stair lift chair. Please feel free to call us is you have questions about the facilities. Tickets are just $15-$20 and members of Portland Musical Theater Company’s Inside Circle email list can save with specail coupon codes just for them. Groups of 10 or more friends, family or coworkers save 20% with our group savings. There are plenty of street parking options around the Peninsula Odd Fellows Lodge location. If you’re feeling fancy, get a “driver” by taking Lyft or a taxi. Cabaret Cafe is a “nightlife” event that can be enjoyed by any mature young person. IS CABARET CAFE HANDICAP ACCESSIBLE? Yes, Cabaret Cafe is handicap accessible. Please note: the theater space at the Peninsula Odd Fellows Lodge is on the second floor. There is a staircase and a stair lift chair for our guests who prefer not to climb the stairs. Those using the stair chair will need to get in and out of it and can bring their wheelchair or walker upstairs. There is no elevator. IS THERE FOOD AVAILABLE AT CABARET CAFE? Yes. Our refreshments team offers yummy desserts and snacks, wine, beer, non-alcoholic beverages and goodies available for purchase. PMTC does not use physical tickets. If you purchase tickets online, you will receive an email with tickets. You may print that out to make seating faster, or have them available on your smartphone. When you arrive for the performance, you will check in with The Cabaret host using your last name. You will then be led to your table by one of our friendly ushers. Cabaret has its origins in 19th-century Paris, at Le Chat Noir, where musicians and poets performed in a casual atmosphere where people felt free to eat and drink. The word and descriptions of cabaret are derived from the French word meaning “wine cellar” to describe the small room where this form of entertainment was born. Over time, European cabaret evolved into a number of forms, including comedy, burlesque and sociopolitical satire. In America, cabaret was performed in speakeasies and other intimate nightclub venues and evolved into a much more jazz-infused style of performance. New York City nightclubs, like the Cafe Carlyle, feature singers associated with music from a genre known as the Great American Songbook. Today, cabaret is its own, identifiable art form, distinctive from musical theatre, nightclub singing, or a concert. The most essential elements of cabaret are simple: a performer in a small room with an audience at close range, seated around cozy tables, with the performer mere feet from the audience.